Wait..what’s this? Standard Deviation? It was my birthday this past Saturday, and the Desmos folks knew exactly what to get me as a present. Abandon all plans, it’s time to play. A lesson I picked up from Daren Starnes (of The Practice of Statistics fame) is a favorite of mine when looking at scatterplots. In the past, Fathom had been the tool of choice, but now it’s time to fly with Desmos. There are a few nuggets from AP Statistics here, and efforts to build conceptual understanding. 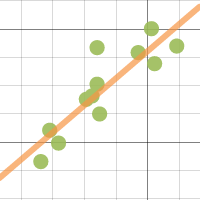 Click the icon to the right to open a Desmos document, which contains a table of data from The Practice of Statistics. In you are playing along at home, this data set comes from page 194 of TPS5e and shows the body mess and resting metabolic rate of 12 adult female subjects. One of the points is “moveable” – find the ghosted point, give it a drag, and observe the change in the LSRL (least-squares regression line) – explore changes and think about what it means to be an “influential” point. Next, click the “Means” folder to activate it. Here, we are given a vertical line and horizontal line, representing the means of the explanatory (x) and response (y) variables. Note the intersection of these lines. Having AP students buy into the importance of the (x-bar, y-bar) point in regression beyond a memorized fact is tricky in this unit. Drag the point, play, and hopefully we can develop the idea that this landmark point always lies on the LSRL. The formula is given on the exam, with b1 acting as the slope, so even memorizing it isn’t required, but we can develop a “feel” for the formula by looking at its components. Click the “Means plus Std Devs” Folder and two new lines appear. we have moved one standard deviation in each direction for the x and y variables. Note that the intersection of these new lines is no longer on the LSRL. But it’s pretty close…seems like there is something going on here. Ask students to play with the moveable point, and observe how close the rise comes to the intersection point. Can it ever reach the intersection? Can we ever over-shoot it? In the “Rise Over Run” folder, we can then verify that the slope of the LSRL can be found by taking a “rise” of one standard deviation of y, dividing by a “run” of one standard deviation of x, and multiplying by the correlation coefficient, r.
There’s other great stuff happening in the Desmos universe as well. 1. This summer brings the 4th edition of Twitter Math Camp, to be held at Harvey Mudd College in California. I’m thrilled to have latched onto a team leading a morning session on Desmos. Consider coming out for the free PD event, and join myself, Michael Fenton, Jed Butler, and Glenn Waddell for what promise to be awesome mornings. To be honest, I feel the Ringo of this crew…. 2. Can’t make it to the west coast this summer? Join me at the ISTE conference in Philadelphia, where I will present a learning session: “Rethink Math Class with the Desmos Graphing Calculator“. Bring your own device and join in the fun! 3. Are you new to the world of Desmos? Michael Fenton has organized an outstanding series of challenges, with 3 difficulty levels, to help you learn by doing. Try them out – they promise to get you think about how you and your students approach relationships. 4. Merry GIFSmos everybody! The team at Desmos has developed GIFSmos to let you build your own animated gifs from Desmos files. EDIT – as Eli noted in the comments, credit for GIFSmos goes to Chris Lusto. Thanks for being so awesome, Chris! A new semester for me started last week. Lots of excitement, new faces, new classes, and much going on professionally. So many feelings coming from all directions…. Last fall, I participated in an Ingite session with the awesome folks from the Math Forum at the Association of Math Teachers of New Jersey conference. Thanks to Suzanne for her kind invitation to share with a group of math leaders I have admired from afar. The videos from the Ignite are finally available. Enjoy my flailing arms in a talk related to a blog post from long ago on math phrases I’d like to expunge. While you are on YouTube, check out talks from the rest of the panel especially Max Ray and Annie Fetter. I marvel at Max’s ability to weave a math story cleanly and effectively about a theme. And Annie always provides ideas I need to try the next day in my math class. This new semester brings me 3 new classes, which are 3 completely different preps: AP Statistics, Academic Prob/Stat (which is co-taught) and CP Pre-Calculus. Are there 3 classes which could be any more different? I feel troubled when I have a schedule like this, since I feel like none of the classes get the attention they deserves, and I spend most of my time chasing my tail. Also, CP Pre-Calc is a course I have never taught before. Does anyone else have trouble becoming invested in developing inquiry lessons for a course, when you know you may never teach it again? Tough days…. For my new niece, who may be born any second now! Our school adjusted the bell schedule this year; the result being structured time in the middle of the day where all students have lunch and/or study time. This semester, I am organizing Hatters’ Discovery Time – an opportunity for teachers to share their passions with students – modeled after the Genius Hour concept. So far, our No Place for Hate team has facilitated an open discussion on race – a well-attended event with productive, positive discussions. This month, one of our science teachers who is also an EMT will share lessons on medical diagnoses, while a fellow math teacher offers an introduction to juggling. My session at the end of February will feature codebreaking, inspired the movie The Imitation Game, and just in time for Oscar season. Sessions on medidation and woodworking are also in the hopper. Such great ideas from my colleagues and hope students enjoy the offerings! The last month has brought a flurry of professional plans for the summer and beyond. I’ve been invited to attend the AP Statistics reading for a 4th year, which is one of the highlight of my year…it’s summer camp for the Stats Kids! Late in June, I have been accepted to share Desmos ideas for the classroom at the ISTE conference in my hometown of Philadelphia. And plans for Twitter Math Camp in July are taking shape: a team of 3 math professionals whose work I all admire and I will team to present morning sessions on “Next Steps with Desmos”, while I have been accepted to present a session on tackling those “tricky statistics concepts”. Should be a blast in LA. All is not lost though. I think it’s time to put the SBG talk away, as I have done it at PASCD and a local conference now. I never got around to editing the video of this talk from our fall ATMOPAV conference, but I’ll share it now for old time’s sake. Enjoy!